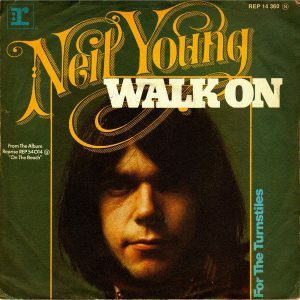 As far as “Walk On” is concerned, while it was written around the same time as the bulk of “Tonight’s The Night” — it turns up on the Roxy live album — it definitely wouldn’t have fit that record at all, both thematically or musically. Sure, it’s the same set of musicians, minus Nils Lofgren, but “Walk On” is far more together musically than any of the Tonight’s The Night tracks, like they were actually sober when they recorded. It’s also more jaunty, with Keith’s slide guitar playing off of Neil’s riff. Lyrically, it’s usually been seen as a response to “Sweet Home Alabama’s” response to “Southern Man” & “Alabama,” though Neil has said that it’s about the record company response to Tonight’s The Night, which doesn’t make any sense-timing wise, unless they first heard it immediately after it was recorded. As an opener to On The Beach, it’s a bit of a misdirection for an album where even the other rockers got pretty dark pretty quick. But, at the same time, it was also a song that was tailor-made to at least get on the FM radio, something that none of the Time Fades Away tracks had a shot of doing. But it’s probably the right misdirection, because out of all of the albums of the ditch trilogy, On The Beach is basically the only one where Neil spent the time to work on the arrangements at least a little bit — having guys from The Band aboard, not to mention Crosby & Nash, probably helped — and so I’m guessing that at the time, the relative professionalism of On The Beach seemed like a step in the right direction, no matter how bleak the songs were.